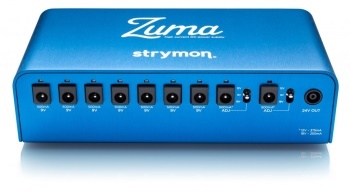 Zuma is the highest horsepower, most technologically advanced effects pedal power supply of its kind. Zuma offers nine high-current, individually isolated, ultra-low-noise outputsâ€”each with its own dedicated regulator and custom transformer. Designed to meet the needs of today’s players, each output provides a staggering 500mA of current.